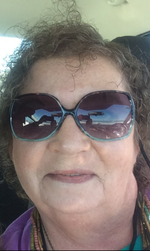 Twila N. Hall Bryant, 64, of Andrews passed away on Monday, September 3, 2018 in Andrews. Cremation is under the personal care of McNett Funeral Home, and memorial services will be planned for a later date. Please celebrate her life by visiting www.mcnettfuneralhome.com. Twila was born on October 6, 1953 in Lubbock, Texas to A.J. Hall and Marion Johnston. She was raised in El Paso, Texas and DeKalb, Illinois and graduated from DeKalb High School in 1972. She earned her engineering drafting degree and culinary degree. She had lived in Alaska, San Francisco, California, Albuquerque, New Mexico, El Paso, Texas, Ashville, North Carolina, Mingus, Texas, and Andrews, Texas. While in Albuquerque, she was the chef creator of Now That’s Italian Restaurant. She had been involved in Amtgard Medieval Boffer Combat and Live Action Roleplay Society in Stephenville, Texas. She met John Garland Bryant on September 1, 1960 in the first grade, when her mother was their teacher. They were reunited back together years later and were married on October 6, 1995 in Lamesa, Texas. She loved knitting, her cats, the family farm in Mingus, riding on the motorcycle with her husband John, and her favorite place was Whidbey Island, Washington. She was preceded in death by her parents. Twila is survived by her husband, John Bryant of Andrews, 2 children, Jennifer Grubbe of Blue Lake, California and David Grubbe and wife, Anne, of Sacramento, California, brother, John Hall of El Paso, Texas, and granddaughter, LilyAnne. To send flowers to the family of Twila N. Hall Bryant, please visit our Heartfelt Sympathies Store.